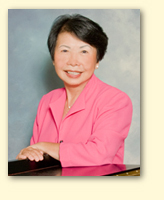 N. Jane Tan, the only person to hold the honor of being a Steinway artist strictly for her pedagogical work, is the founder-director of The Well-Prepared Pianist Institute (WPP Institute). Retiring after thirty years of teaching at Towson State University in Maryland, she is dedicating her energy to The Well-Prepared Pianist teacher-training program and PianoTeams® ensembles. 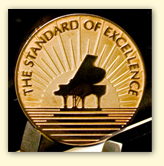 Her work in these high achievement curriculums is internationally recognized and has earned her Steinway’s 150th Anniversary Standard of Excellence gold medallion award in 2006. In the WPP program, teachers are taught the art of mentoring students in long-term permanent goals through left/right brain training, multi-sensory learning and multi-sensory memories. The goal for students is either to complete their learning and become independent pianists before entering high school or to use their WPP training as foundation for advanced high school level study in preparation for careers in piano. The program has been started in China. PianoTeams® , an internationally registered trademark of WPP Institute, was a title coined to mean five pianists playing repertoire specifically composed or arranged for five pianos. It was originally conceived in 1979 for her college piano majors as a tool to develop spontaneous musicianship through interactive music-making. PianoTeams® began with orchestral favorites which Professor Tan re-wrote for five pianos. Today, PianoTeams® repertoire has grown to include original works and pieces on traditional melodies. They are performed by a wide range of pianists from young beginners to concert artists worldwide. Raised by Chinese parents in the Philippines, Tan came to the U.S. as a Fulbright-Hays scholar to study with Leon Fleisher at the Peabody Institute in Maryland. Besides Leon Fleisher, her mentors included another Artur Schnabel pupil, Edward Mattos. As one of the most sought after master teachers, artist-lecturers and composers, Tan travels extensively internationally and from coast to coast in the U.S. Her WPP Institute has teacher-training centers scattered all over the U.S. and centers being planned internationally. As a writer-composer, her works are performed and studied in many countries throughout Asia and Europe. Seymore Bernstein has accrued scores of "triumphs" in a variety of activities. He studied with such notable musicians as Alexander Brailowsky, Sir Clifford Curzon, Jan Gorbaty, Nadia Boulanger and Georges Enesco, both in this country and in Europe. His prizes and grants include the First Prize and Prix Jacques Durand from the international competition held at Fontainebleau, France, the National Federation of Music Clubs Award For Furthering American Music Abroad, a Beebe Foundation grant, two Martha Baird Rockefeller grants and four State Department grants. His concert career has taken him to Asia, Europe and throughout the Americas where he has appeared in solo recitals and as guest artist with orchestras and chamber music groups. In 1969, he made his debut with the Chicago Symphony Orchestra playing the world premiere of Concerto No.2 by Villa-Lobos. Acclaimed for his "...technical brilliance and penetrating interpretive skills," Seymour Bernstein is also an internationally known writer, composer, teacher and lecturer. His books, With Your Own Two Hands (also published in German, Japanese and Korean), 20 Lessons in Keyboard Choreography (also published in German), the children's version, Musi-Physi-Cality (also published in Japanese) and his videotape, You and the Piano, have been hailed by critics as "firsts of their kind," and "landmarks in music education." One of the most sought after clinicians in this country and abroad, Seymour Bernstein is in constant demand for master classes and educational programs. He is the recipient of many commissions, and performances of his works have earned him awards from ASCAP. His choral work, Song of Nature for SATB, narrator, soprano solo and scored for orchestra by Randall Svane had its premiere performance in Carnegie Hall on June 1, 1997.